The ingenuity, grace, and power of an ancient culture comes to you in this addition to our Ready for Battle line. The Ready for Battle Dao LARP Sword echoes a touch of oriental design, in a LARP blade that is durable, strong, and best of all, affordable. And while it might not be as detailed as some of our other models, it is every bit as reliable and strong, making it a solid choice for beginners on a budget, as well as for experienced fighters who want something straight-forward and fast. 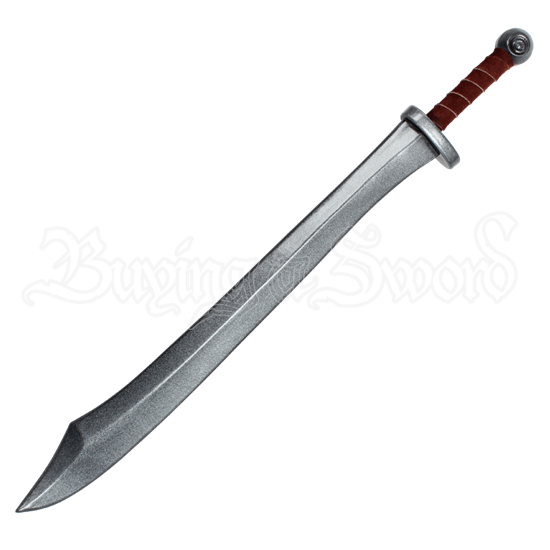 The blade has a scimitar-like curve and an oblong guard, as well as a round wheel pommel and a short hilt that is perfect for a single-handed grip. The hilt and pommel comes in gold, silver, or bronze. The handle is wrapped in suede for comfort, and the color of the wrap may vary as well. We will send what is available. This oriental-inspired sword measures approximately 29.5 inches long, although this measurement can vary, as the items are hand-made. Latex weapons do need to be maintained to a certain degree. We offer a Maintenance Silicone (item number MCI-2000) that can be purchased separately in the LARP Accessories section. We recommend you use the Silicone on a regular basis, as it is an easy, spray on application. The silicone will keep the coating flexible and make the weapons last much longer. The maintenance silicone protects the coating from drying out, and helps the weapon resist wear and tear.